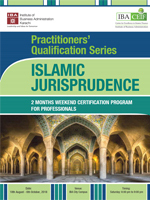 IBA Centre for Excellence in Islamic Finance (IBA-CEIF) is pleased to offer a two-month intermediate level weekend certification course to provide an understanding of Islamic Jurisprudence (Fiqh) and the Shariah principles governing Islamic Finance. It aims at developing a workable understanding of the reasoning and principles underlying the rules of Islamic law through the analysis of a wide variety of primary and secondary sources. The course intends to strengthen application of Fiqh in personal and commercial dealings. Mufti Bilal Ahmed Qazi is MBA from Institute of Business Administration (IBA), Karachi. He also holds Al-Aalamiyyah (a Master's degree in Arabic & Islamiat) and specialization in Islamic Jurisprudence from Jamiah-tul-Uloom Ul-Islamiyah Binori Town and Jamia Darul-uloom, Karachi. He serves as the Shariah Board Member of Summit Bank, Soneri Bank, and Al Baraka Bank Pakistan. Mufti Bilal has written over two thousand Fatwas on various issues of high importance. He is Visiting Trainer at IBA-CEIF and CIE (Centre for Islamic Economics), a Faculty of Jamia Darul-uloom Karachi. He has been a Shariah Advisor to NAFA Islamic Mutual Funds (Pakistan).